The trade in books was carried on by Jews long before the invention of printing. A catalogue of a bookseller of the twelfth century was unearthed a few years ago in the Fostat Genizah ("Jew. Quart. Rev." xiii. 52). The poet Immanuel of Rome (about 1300) relates that a book-seller named Aaron of Toledo traveled to Rome with 180 Hebrew manuscripts, which, however, he sold at Perugia. With the introduction of printing, the book-trade centered in Italy, where Hebrew printed books were first produced. Itinerant booksellers, after providing themselves with their merchandise at the depots of Venice, Mantua, Padua, Cremona, etc., traveled from place to place, offering their goods wherever Jews were to be found. Thus, Benjamin Ze'eb of Arta (1500) says that there were many itinerant booksellers who greatly aided the propagation of Jewish books (Responsa, 63a). In the sixteenth century, with the increase of printing-offices in Germany, Bohemia, and Moravia, Italy gradually ceased to be the headquarters of the book-trade; so that in the middle of the seventeenth century De la Grange writes to Buxtorf the elder, who traded in Hebrew books, that he is unable to find a bookstore in Venice ("Rev. 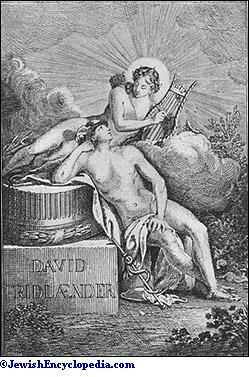 Etudes Juives," viii. 75). About this time Frankfort-on-the-Main became the center; all books published in Germany, Bohemia, and Poland being exhibited at the fair in that city. Two booksellers of Frankfort, Gabriel Luria and Jacob Hamel, were in correspondence with Buxtorf in reference to the book-trade (ib.). 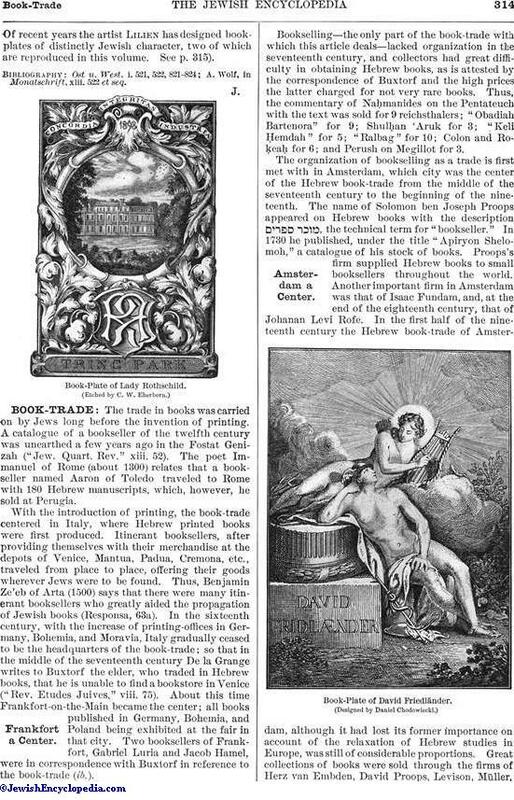 Bookselling—the only part of the book-trade with which this article deals—lacked organization in the seventeenth century, and collectors had great difficulty in obtaining Hebrew books, as is attested by the correspondence of Buxtorf and the high prices the latter charged for not very rare books. Thus, the commentary of Naḥmanides on the Pentateuch with the text was sold for 9 reichsthalers; "Obadiah Bartenora" for 9; Shulḥan 'Aruk for 3; "Keli Ḥemdah" for 5; "Ralbag" for 10; Colon and Roḳeaḥ for 6; and Perush on Megillot for 3. The organization of bookselling as a trade is first met with in Amsterdam, which city was the center of the Hebrew book-trade from the middle of the seventeenth century to the beginning of the nineteenth. The name of Solomon ben Joseph Proops appeared on Hebrew books with the description , the technical term for "bookseller." In 1730 he published, under the title "Apiryon Shelomoh," a catalogue of his stock of books. Proops's firm supplied Hebrew books to small booksellers throughout the world. Another important firm in Amsterdam was that of Isaac Fundam, and, at the end of the eighteenth century, that of Johanan Levi Rofe. In the first half of the nineteenth century the Hebrew book-trade of Amsterdam, although it had lost its former importance on account of the relaxation of Hebrew studies in Europe, was still of considerable proportions. Great collections of books were sold through the firms of Herz van Embden, David Proops, Levison, Müller,and many others. At present there are only two bookselling firms of any importance in Amsterdam; namely, those of Joachimsthal, and Levison, the successor of Proops. From the middle of the seventeenth century to the first half of the eighteenth Frankfort-on-the-Main was the center of the Hebrew book-trade in Germany. The leading booksellers of the seventeenth century were: Isaac and Seligmann Reis, Joseph Trier Cohen, Simon Trier, and Solomon Hanau; in the eighteenth, Solomon ben Raphael London, Elijah ben Azriel of Wilna, Löb Schnapper, Simon Wolf ben Abraham Mainz, David ben Nathan Grünhut of Heimerdingen, and Moses ben Kalman Speier. From the middle of the eighteenth century the book-trade in Frankfort gradually declined. At present (1902) there are but three Hebrew booksellers of importance in that city; namely, J. Kauffmann, Joseph Baer, and Hofmann, who deal mainly in second-hand books. Among the other places in Germany where the Hebrew book-trade was carried on in the eighteenth century may be mentioned Altona, Dyhernfurth, Frankfort-on-the-Oder, Fürth, and Berlin. 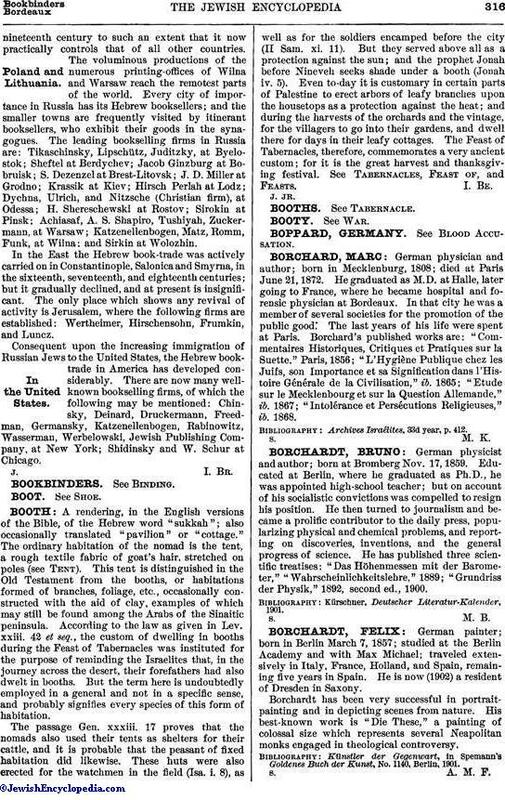 The leading booksellers in Germany in the nineteenth century, besides those mentioned above, were: Adolf & Co., Asher & Co., Benzian, Bislicher Brothers, Calvary, and Poppelauer, at Berlin; Jacobsohn at Breslau; J. G. Müller at Gotha; H. W. Schmidt at Halle; Goldschmidt at Hamburg; Baer, Otto Harrasowitz, Köhler, and Richter, at Leipsic; R. N. Rabbinowitz and L. Rosenthal at Münich; J. J. Heckenbauer at Tübingen; and Jollowicz at Posen. From the second half of the eighteenth century to the middle of the nineteenth the Hebrew book-trade of Alsace-Lorraine was carried on at Strasburg, Metz, and Lunéville by the printers Moses May, Ephraim Hadamar, and Joseph Meïr Samuel. At present the trade there is quite unimportant. France has never been a congenial field for the trade. Only three firms—and these are of no importance—can be found to-day at Paris; namely, those of Durlacher, Lipschütz, and Blum. In London two important firms, Abrahams and Valentine, have existed for at least a century and a half. Italy, which, as stated above, was the cradle of the Hebrew book-trade, had in the nineteenth century only a few firms at Leghorn, Turin, and Florence. At the beginning of the sixteenth century Prague and Cracow were important centers; the trade being carried on by the Gersonides family of printers in the former city, and by Wedekind, Kurzins, Isaac ben Aaron of Proctiz, and others in the latter. Later several other places, such as Brody, Lemberg, and Vienna, became conspicuous in the trade. The leading booksellers in the nineteenth century in Austria were: Knoepflmacher, Lippe-Löwy, Schlesinger, Schmid, at Vienna; Landau and Pascheles at Prague; Schönblum at Lemberg; Faust at Cracow. 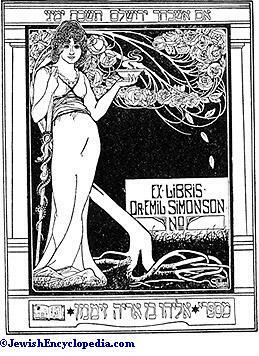 Book-Plate of Dr. Emil Simonson. (Designed by E. N. Lilien. )Poland and Lithuania. Small and unimportant as was the book-trade in Poland and Lithuania, it developed in course of thenineteenth century to such an extent that it now practically controls that of all other countries. The voluminous productions of the numerous printing-offices of Wilna and Warsaw reach the remotest parts of the world. Every city of importance in Russia has its Hebrew booksellers; and the smaller towns are frequently visited by itinerant booksellers, who exhibit their goods in the synagogues. The leading bookselling firms in Russia are: Tikaschinsky, Lipschütz, Juditzky, at Byelostok; Sheftel at Berdychev; Jacob Ginzburg at Bobruisk; S. Dezenzel at Brest-Litovsk; J. 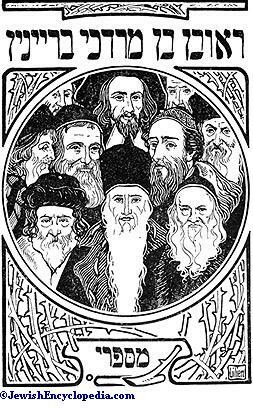 A. Miller at Grodno; Krassik at Kiev; Hirsch Perlah at Lodz; Dychna, Ulrich, and Nitzsche (Christian firm), at Odessa; H. Shereschewski at Rostov; Sirokin at Pinsk; Achiasaf, A. S. Shapiro, Tushiyah, Zuckermann, at Warsaw; Katzenellenbogen, Matz, Romm, Funk, at Wilna; and Sirkin at Wolozhin. In the East the Hebrew book-trade was actively carried on in Constantinople, Salonica and Smyrna, in the sixteenth, seventeenth, and eighteenth centuries; but it gradually declined, and at present is insignificant. The only place which shows any revival of activity is Jerusalem, where the following firms are established: Wertheimer, Hirschensohn, Frumkin, and Luncz. 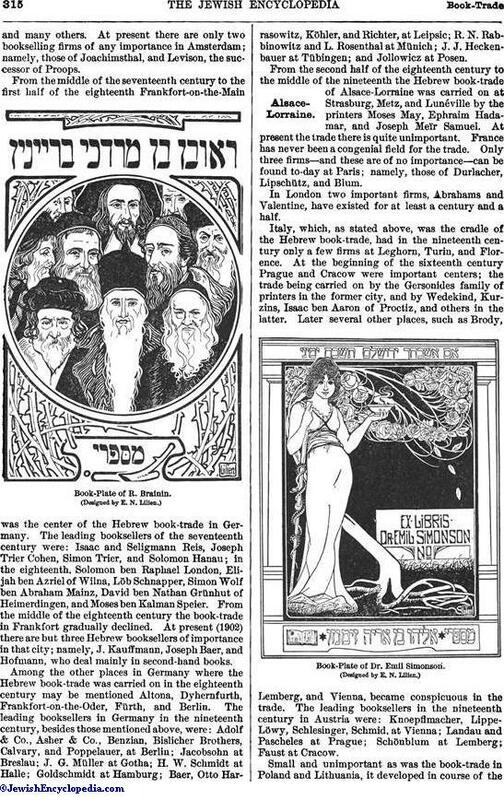 Consequent upon the increasing immigration of Russian Jews to the United States, the Hebrew book-trade in America has developed considerably. There are now many wellknown bookselling firms, of which the following may be mentioned: Chinsky, Deinard, Druckermann, Freedman, Germansky, Katzenellenbogen, Rabinowitz, Wasserman, Werbelowski, Jewish Publishing Company, at New York; Shidinsky and W. Schur at Chicago.